Used these on volunteer day in school. Absolutely great. If you're looking for a simple way to protect your pupil's clothing, our Gompels Small Aprons Flat Pack is an ideal resource. Each one has been manufactured from a disposable polythene material which provides an effective barrier against splashes and spills. They fit securely with a halter neck fastening and waist ties to keep them in place during all kinds of different activities. For ease of storage, this entire pack of 100 aprons are provided in a convenient flat dispenser pack which allows for single, non-stick removal. 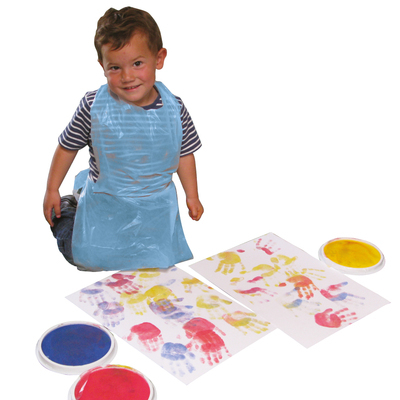 Each of these small aprons is ideally sized for use by younger children and during Arts & Crafts sessions. For additional protective items, consider adding our Childs Plastic Wipe Clean Tabard or our Splash Mats Assorted to your basket today. We also strive to support all levels of creativity in nurseries and schools with items such as Glue Sticks and Ready Mixed Paint.